View More In Small Appliances. 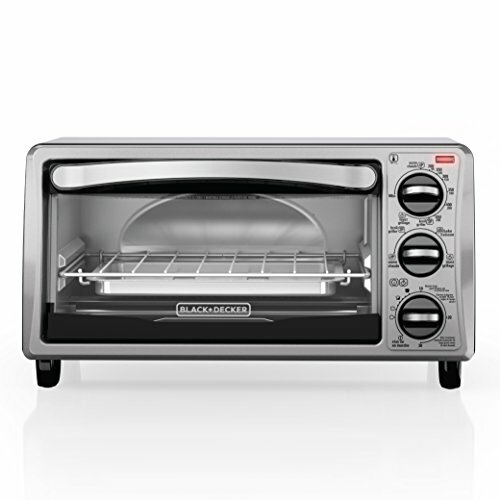 Large enough for a 9” pizza or four slices of bread, the BLACK+DECKER 4-Slice Stainless Steel Toaster Oven with Broiler Pan complements any kitchen countertop. This compact, versatile toaster oven bakes, broils, toasts, and keeps food warm, at up to 450°F. It comes with a baking and broiler pan that fits perfectly into the small toaster oven interior. Plus, our exclusive EvenToast Technology optimizes heat distribution to toast bread evenly. When it’s time to eat, trust the #1 brand in toaster ovens*—BLACK+DECKER. Large viewing window keep an eye on food during cooking. The durable glass window gives you a clear view of food throughout the cooking process. Bake/broiler pan don’t worry about finding pans to fit in the oven. The included baking/broiling pan fits perfectly, making it easy to insert and remove food. Toasting rack also included. EvenToast Technology - The toaster oven interior is specially designed for even toasting of up to 4 slices of bread at a time. 9" Pizza, 4 Slices of Bread - The compact toaster oven fits nicely on the countertop, while the curved interior makes room for 9" pizzas and 4 slices of bread. Four Functions - The stainless steel toaster oven's cooking functions include: baking, broiling, toasting, and keeping food warm. 30-Minute Timer - The timer includes precise toast settings and stay-on functionality. Removable Crumb Tray - Keep the toaster oven clean with the convenient removable crumb tray. If you have any questions about this product by BLACK+DECKER, contact us by completing and submitting the form below. If you are looking for a specif part number, please include it with your message.